Our partners saw an opportunity to add value by promoting this principle; educating our clients and prospects using a wealth of communication tools we had available. Over the next 18 months, we obtained certifications in wellness coaching, wellness program management, fitness, and nutrition. We began evolving our education campaigns for clients by sharing community resources, conducting needs and interest surveys, serving on client committees, coordinating health fairs, screenings and fitness challenges, and more. 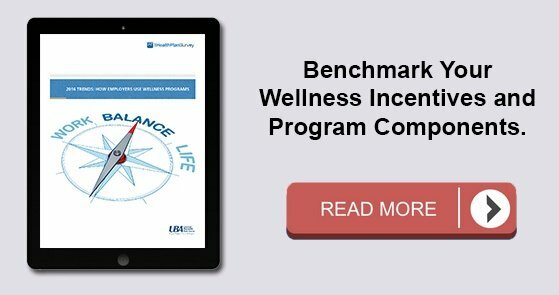 We began to see the “value” in what we were providing our clients and prospects, but we also knew that in order to be good role models of health, we too needed to “walk the talk” and roll out our own employee wellness program. With a focus on education, prevention, and early detection programs, our wellness program strives to provide the knowledge and tools for our employees and their families to make healthy lifestyle choices. Our committee is comprised of representatives across departments and locations. These champions share the load of our program, chairing at least one activity each year. They are an integral part in the planning process and they motivate others throughout the year, truly taking “ownership” in the program. Today, our program encourages teamwork, fosters relationships, and creates healthy competition. Employees support one another more than ever before! Whatever the activity, there is most likely another co-worker to do it with. Employees engage with one another across departments, locations, and with their families sharing what they have learned. Our program has become an extension of the benefits we provide to our employees because it is packed with tools and resources to encourage and support their individual paths. Since its inception, our program has earned local and national awards, including having VolkBell being voted one of the best small employers to work for in 2015. A few highlights of our adventures include: spirit days, bike rides, and runs. Our employees have helped in harvesting projects and spend considerable time volunteering across the community. One of the greatest rewards is the testimonial from a 16-year VolkBell employee. Over the past four years, VolkBell has collected data that has shown the value of investment that Stayin’ Alive has provided to employees. 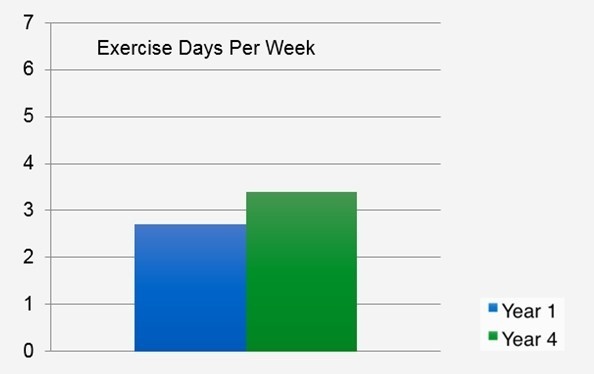 The number of minutes employees are exercising have gone up from 81.52 minutes a week (2.6 days a week) in year one, to 101.22 minutes a week (3.5 days a week) in year four. Depression, on average, has also gone down in the last four years. 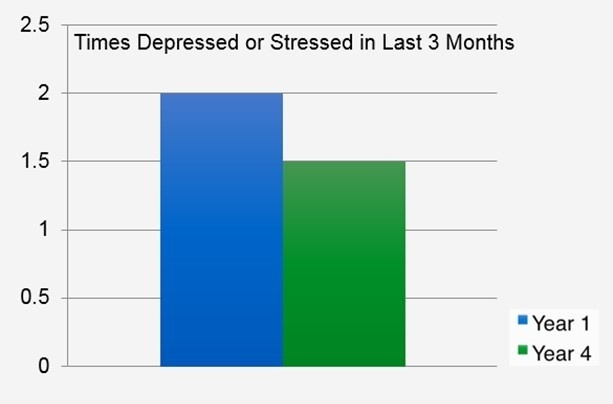 In year one, employees stated feeling depressed two times in the past three months to feeling depressed 1.5 times in the past three months in year four. Productivity has gone up from 2.92/10 in year one to 6.6/10 in year four. There have also been fewer days absent from work as the program has progressed. Productivity and absenteeism are important to note because even though they are nearly impossible to track, the fact that employees are reporting such significant increases in productivity and reductions in absenteeism is notable. Following the implementation of our own program and having our own internal experiences, we were able to build more education, tracking programs, measurable data, and were able to provide an opportunity to create real behavior changes with clients. We wanted to help employers tackle the same common problems we were facing and help them avoid the pitfalls in program design and execution. There was a need to align these wellness programs with benefit plans and become more of a consultant and less of a coordinator. Our consulting approach is not to just “hand a client over.” We stay with them every step of the way. 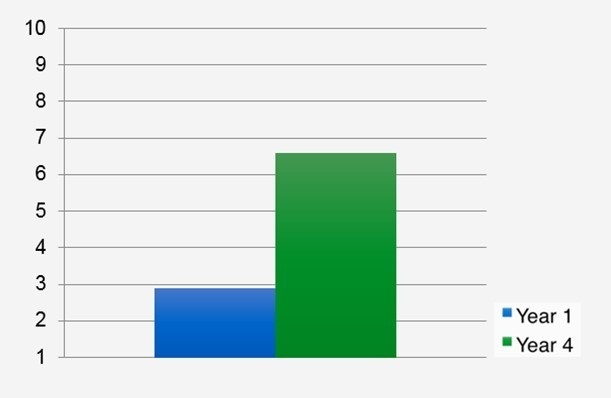 There is an advantage in retention as our clients and prospects are aware we have a program and value the importance enough to ”walk the talk” with our own program. Clients want to know what we have done, who we have worked with, what has been successful, and what has not. It is the best reference for our clients. Wellness aids us in driving outcomes and assisting clients and their employees and families achieve their own personal health goals and creating changes that can be of value to the overall health care system. Having a passionate staff and a committee trained and skilled in health and wellness is definitely a differentiator. Clients that can see beyond an ROI and recognize that there is a greater VOI (value of their investment) are seeing greater success. Successful programs have strong partnerships and alliances with wellness vendors, community resources and national associations to further support our services. Whether you are a broker, HR professional or CEO, I encourage you to develop strong partnerships as they are integral to your program’s success. Most important, the coordinators of these successful programs understand that at the end of the day it’s about making someone’s life better! As we move into our ninth year of wellness programming, I wanted to provide a snapshot of where some of our client’s programs are today. These are great examples of programs done right. Today, our client’s programs are customized around the client, their culture, and the vendors we partner with to meet their unique design and needs while also upholding our service level standards. In fact, when possible, we feel strongly that having a wellness vendor is “key” to a truly successful program looking to create change. Each program has a designated wellness budget, a committee, and a primary wellness representative that we work with ongoing. Most all of our programs are points based, so the employees earn points for completing activities. Other clients not shown above focus on educational, non-incentive type programs for their employees. Clients with a culture of wellness bring many benefits that are not necessarily calculated through claims costs, health care expenditure, etc. They are recognized through the statements directly from the employees. "In short, I came for the savings, I stayed for my health. The first year, I only participated for cost savings thinking, ’who would really like this?’ The following year, I signed up for a health coach. Now I'm living healthier, eating better, exercising more, and more importantly, feeling better. Now I think ‘who wouldn't really like this?’"